We recorded the Funk For Life album in June 2009 in Berlin, at the famous Hansa Studio, where so many great bands have been making fantastic records over the years. At the same time the band was booked to play a week at the jazzclub A-Trane during the ACT week. I figured it would make sense to record daytime and play gigs at night. It turned out to be a very good idea. Everybody in the band gave everything on the gigs, coming to the studio the next day at 11 am, full of new power and new ideas. It was hard but it sure was fun and it was worth it too! After finishing the basic recordings, we all went on with our lives until it was time to finish the album, which has been done in different small studios in Berlin, in someone’s basement in Stockholm, in the guesthouse in Kibera, in the studio in Paris or in my little house in Skillinge, Sweden. Wherever we bring our instruments, that’s where music is being made. Funk For Life is a true Funk Unit album, with hard hitting riffs, drummers laying down great grooves, spitting horns and chanting vocals. All the ingredients that have made Funk Unit a name in the world of music. Only, this time it’s with a cause: To help young people to find a way out of their misery. Music knows no boundaries and has no borders. Music is universal. I do believe that the magic of music is the best thing you can ever give to anyone, so why not start by making music a way of getting out of the situation the kids in Kibera are in? To begin with, try to bring as many instruments as possible to give away? Those were my thoughts when I approached my close friend and world famous photographer Mattias Klum about the project. We had decided to work on a big project on the subject of pollution in and around the Baltic Sea, so we where already into doing things together. He said: “I’m in and I’ll bring a small team.” And so he did. On our trip Samuel Svensäter came along as Mattias assistant, together with the very experienced film photographer Peter Östlund – wonderful people that knows what hard work means and what can come out of it. Then I contacted Mats Udd at Yamaha Sweden. We know each other ever for a long time. Since many years he is the head of sales at Yamaha and as I have been endorsing the company for 24 years, I figured he was the one to talk to. He just said, “we’ll give you what we have left”, it was just after the music school in Sweden had made their orders. I had already talked to my band the Funk Unit and all of them said yes. 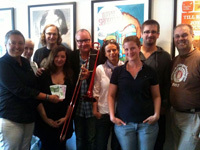 I met with ACT and Siegfried Loch, informing him of my idea to give 1 Euro per sold CD to MSF and this project. He simply said, “I’ll bring in half of it.” And then he went one step further: As no-one knows exactly how many CDs will be sold in these times of continually decreasing CD sales, ACT will present a cheque to MSF, at the CD release, for 20,000 euros as a guaranteed advance payment of the expected donation amount. What great news! By the way, upon mentioning ACT: I’ve been with the company for 15 straight years. What a bliss indeed, in this strange world of the music industry. 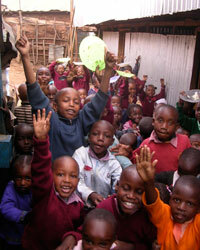 Ok, so the time to leave for Kibera, Nairobi, came closer and closer and we all worked hard to get everything together. Visas, Customs declarations, finding accommodations, getting the travel organized… Dan Sermand managed to get KLM-Air France to sponsor the tickets for all of us.13 people all in all and a lot of equipment and all the instruments went down and got through without any problems, for which we are forever grateful! Directly upon arrival in Nairobi, there was a party where we got to meet some of the people working for MSF in Kibera – incredibly many nationalities getting together in a very friendly way, to wash the day off with a few beers and some laughter before the next long workday. It felt good right away being around new friends, all with the mutual goal to do good in some way. Well at “home” in the Guesthouse of MSF Belgium behind bars, barbed wire and armed guards, the welcome given by our host Nancy told us all that we were in very good hands indeed. For the first time in 20 years, the whole band slept more or less in one room, including Magnum, Magnus, Jonas, Andy, Robert and Sebastian plus Dan, Mattias film team and our crew Jan, Jörg and a few MSF friends stopping over on their way to missions in Sudan. Just like a big family and it really worked out great throughout the whole stay. Music was played every hour of the day and night when at home. Always someone plucking on a guitar, playing the tambourine, testing a trumpet or a flute somewhere in the house and a great feeling of togetherness spread around us. On the way out we heard the voices of children singing behind a fence, so we asked if we could come in. They sang, all these little kids with no parents, alone in the wor ld but still, having found refuge in this little school in the very heart of Kibera. They sang for us. And they danced. A very emotional moment! The next days and nights were filled with work and music, from filming the sunrise over Kibera, making a video for the title song “Funk For Life”, playing a concert at the National Museum in Nairobi as well as shooting a documentary about the life in Kibera. On the second last day we played a free outdoor concert in Kibera, music filling our souls, red dust blinding our eyes and filling our lungs. On the evening of that concert, Richard from MSF Belgium threw a party in the guesthouse and we all played and sung together all night, MSF employees and Funk Unit all alike, ending with Nancy and her sister teaching us Swahili. A better way of spending time with friends, new or old, is really hard to imagine. On the very last day of our very first visit, we finally got together with the children from the three schools we had been advised to give our instruments. Under a big tree behind one of the clinics, we met on the red soil: Baraka za Ibrahim School, Stara School and Kibera Hamlet. What a joy to see their enthusiasm while trying all the different instruments out. Each and everyone managed to get a tone out of any instrument we brought, trumpet or flute, altosax or trombone. Quite amazing, we thought. At the end of the session we presented our gifts to the teachers and the children, knowing that something had changed. It was a start of something and we do not know the end of it but we know that there is no way we are going to let go of these children. Now we know that there is something to be done to help them towards a better life through music. We have seen it happen and we will continue to make it happen, again and again. Nothing can stop us now. Maybe nothing can stop them either! Every child has the fire within – only, someone has to light it up. 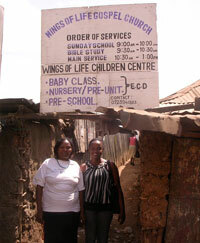 The Wings of Life Children’s Centre has been established in 2004 as a childhood development centre in the slum of Kibera on the Wings of Life Gospel Center foundation early 2000. The Wings of Life centre has for ambition to support and help destitute children of the slum and other street children in Nairobi victims of poverty, family breakdown, abuse and neglecting who live in a precarious situation of suffering, hunger, lack of education, of love, etc. The children the centre helps are from a range of 4 to 8 years old often from single parents/guardian, abandoned or orphans. The Wings of life team, composed of 3 volunteering teachers and one subordinate staff, are providing counselling, education and food to around 200 children. Nils Landgren launched in December 2009 an initiative to assist this programme managed by Pastor Jane Macharia by supporting financially, together with close friends, the feeding programme of the Centre in order to ensure that’s these kids have access to food daily. The kartsen Jahnke Konzertdirektion in germany supporting Nils Landgren initiative towards Wings of Life in Kibera. Two bands at “jazz under stjärnorna”in Brantevik (Sweden): “Pipps blue five” & “Hammondbolaget” donated their well deserved money for their contributions to Wings of Life.